For some reasons, you have to change the default engine of your mysql database tables to another engine. For example, MyISAM to InnoDB. MySql allows us to change by using command line and if you’re using phpMyAdmin, you just need a few clicks. I just noticed that I see only the status messages, links and photos from friends whom I know them personally in Facebook. I did not realize that it is the default set by Facebook until I read a note shared by my friend in Facebook. What Facebook does is that News Feed on your facebook account only shows the updates from your friends whom you’re interacted most. It means that you don’t see any other updates from some of your contacts you never interacted. To change this feature, scroll down to bottom of Facebook until you see “Edit Options” link. 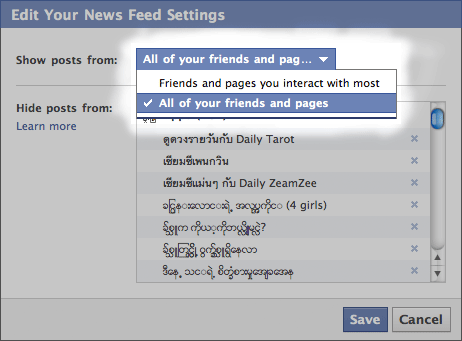 Click on it and you will see “Edit Your News Feed Settings” dialog box. Select “Show posts from” menu and change it as your personal choice. Have you ever wonder of how you can download or backup your facebook profile, status messages, links, photos and even messages that you shared with your friends in Facebook? Facebook has a feature that allows you to download all those information in zipped format which contains messages, status, links, photos and messages. Click Account upper right corner of your Facebook account. Go to Account Settings -> Download Your Information. For the first time, Facebook will ask you to wait for sometime and you will get email shortly which includes download link. Unzip the file, and browse index.html file with your browser. Now you can see your facebook profile locally with minimalist interface NOT Facebook interface.